The glorious aroma of coffee brewing - a heady fragrance that seduces coffee lovers world-wide. 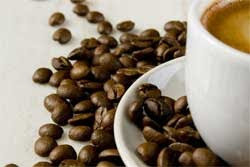 Coffee lovers have very definite preferences and opinions as to which ingredients and varieties produce the perfect cup. BUT are we comfortable when confronted with the array of coffees and coffee beans in speciality shops and supermarkets? Back Chat takes you on a fascinating journey through the bewildering world of coffee. Enjoy this learning experience and become confident in your choices. If questions or problems still remain, do contact me at Back Chat at http://www.leslieback.co.za or email me at les@leslieback.co.za . I would love to help you find the answers. By developing your taste buds, through lively experimentation, the sea of coffee beans will certainly become less formidable and more familiar. Acidity is the sharp, snappy taste that defines your coffee. Body is the heaviness and thickness of a coffee as it touches your tongue. Flavour is a combination of all the above and is defined by the relationship they have to each other; rather like describing the elements of a love-affair. Coffee does not grow ready for use. All coffee must be roasted before it is ground and then brewed. Unroasted coffee is referred to as 'green coffee'. The roasting process demands the skill of a Roast master whose senses are finely tuned, much as the palate of a wine-maker or a perfumier's nose. Roasting is both a science and an art. As the beans roast, distinct stages of appearance and flavour occur. Although roasters have identified these flavours, they have a hard time agreeing what to call each one. A full roast in one store may be called Viennese in another. LIGHT OR PALE ROAST is used for delicately flavoured beans. The beans have a dry, cinnamon - coloured surface and are often brewed to serve as morning coffee. Try, as the French do, serving 'café au lait' using an oversized breakfast cup and serving equal portions of warm milk and piping hot coffee. MEDIUM, CITY OR AMERICAN ROAST is the all purpose roast most Americans prefer and drink in the 'bottomless' cup of coffee. The beans are medium in colour and their surface is dry. FULL, HIGH OR VIENNESE ROAST is the favourite of many specialty coffee stores. The taste strikes an even balance between sweetness and sharpness. The beans are chestnut in colour and show patches of oil. French, Continental, or Dark Roast have a tangy, rich flavour. The beans are the colour of semi-sweet chocolate and shiny with oil. When chicory is added to this roast you have a Louisiana-style coffee. ESPRESSO OR ITALIAN ROAST is the darkest of all roasts. The almost black beans have a glossy surface and a pungent flavour - a favourite of espresso lovers. Roasters, the world over, name their roasts differently. An overdeveloped roast would be too dark and an underdeveloped roast too light. Italian and French roasts are very dark and dark respectively; Viennese style roasts are various degrees of medium; and American, Cinnamon and Scandinavian are light roasts. Decaffeinated coffee is for coffee drinkers that do not want the effects of caffeine. Among the techniques for removing the water soluble caffeine is the preferred Swiss Water Process. The decaffeination process most disliked is the straight solvent method. It appears that what has improved is the quality of the green, unroasted beans used to make decaffeinated coffee. Although dedicated coffee drinkers have very strong opinions on the subject, if caffeine presents a problem try this option. Filters, coffee-makers and all other equipment should be thoroughly cleaned after each use. If allowed to remain, the sediment can absorb odours and the remaining coffee oils may turn rancid. A combination of baking soda and water is the best cleaning agent. If the water from your kitchen tap reminds you of fresh mountain water, it will make a great cup of coffee. When however you do not like the taste of your local water, you might want to experiment with bottled water, or more ideally, a water filtering device that is economical and easy to use. When brewing, the reason you use hot water is to draw out the flavour. You don't want to cook the beans - roasting has achieved that. The best brewing temperature for coffee is between 95-98 degrees, just before boiling point. Always fill your kettle with freshly drawn cold water. When your kettle has reached rapid boil, hold for a moment before pouring the water over your grounds. That will lower the water to the correct temperature. Leaving the kettle boiling too long, causes the water to lose too much oxygen and your cup of coffee will taste dull. The correct grind permits water to pass through the coffee in the correct time. a) Don't grind your beans so fine that particles clog your filter. b) Don't grind your beans so coarse that hot water rushes through the ground without having a chance to really wet them and draw out their flavours. With a fine grind your brewing cycle should take no longer that 4 minutes; with a drip grind 4-6 minutes, with a regular grind no more than 8 minutes. Brewing coffee too long will give it an unpleasant bitter taste. Personal taste ultimately dictates your formula of coffee grinds to water. For a full-flavoured cup of coffee use 2 level tablespoons of coffee (or one approved coffee measure) to 150 ml of water. This will fill a normal cup, not a large mug. If you prefer a weaker brew, dilute with hot water. Don't use less coffee. A good tip is to compact the coffee granules firmly with the back of a spoon. Important : Within 15 minutes of brewing, coffee begins to deteriorate. Avoid using aluminium pots or cups when making or serving coffee as it imparts a bitter taste. Glass and porcelain are the best material to use in brewing and serving. If you do use metal, stainless steel is the better choice. Preserving the brew is a challenge. When necessary the best way to keep your coffee piping hot and as fresh tasting as possible is in a pre-heated vacuum-insulated thermos bottle or carafe. If you use a thermos or a carafe to store your coffee after brewing, be sure to use one that is lined with glass. Consider buying a taller, thinner carafe rather than a shorter more round one as the taller one will expose more of the coffee to the interior of the thermos and therefore keep your coffee warmer for a longer time. NOTE: Never reuse coffee grounds. There are several styles of coffee makers, all with their own staunch followers. PERCOLATORS boil coffee, which eliminates most of the aromatics by burning and oxidizing them and the coffee becomes more bitter. Avoid percolators where possible. FILTER The filter-paper method is an excellent way to brew a clear light-bodied fragrant cup of coffee. It involves disposable paper filters or if you prefer, a reusable gold mesh filter. VACUUM POT This is a system using steam pressure. Some models can be used on top of the stove. MOKA EXPRESS This is mainly for making espresso coffee at home. Espresso in Italian means fast. This can also be used on top of the stove. ESPRESSO AND CAPPUCCINO MAKERS In addition to stove-top espresso makers, there are also counter-top espresso machines. They are more pricey than the moka variety and do not necessarily make a better cup of coffee, however they are stylish. Espresso can be enjoyed in many forms: regular, double, short, long. Café Latte is a single espresso, served in a long glass a filled to brim with steamed milk and cream. Caffe Frappe, is a cold concoction. Café Mocha is an espresso combined with chocolate syrup and lashings of foamy steamed milk. Cappuccino is topping an espresso with luxurious creamy foam from steamed milk. Some of the steamed milk is added to the mix. Dust with sweetened cocoa powder or cinnamon. NEAPOLITAN FLIP DRIP In Italy it is called Napoletana Macchinetta; in France the Café Filtre, but the American nickname describes its unique and amazing characteristics: the Flip Drip. This gadget involves sleight of hand as during the course of brewing, the machine is flipped over. Oven gloves are recommended as the pot and its handles are too hot to handle. Before you begin the coffee-making process, decide which option to explore: Ready ground coffee, available at specialty coffee houses and most supermarkets. If you prefer the home-grinding option, various equipment is available. The most popular being an electric grinder. A good rule for a home brew: The shorter the brewing time, the finer the grind should be. The finer the grind, the more intensely flavoured the coffee will be. The coarser the grind, the more delicate the brew. REGULAR STRENGTH 2 level tablespoons ground coffee to each 150 ml (3/4 cup) water. EXTRA STRENGTH 2 level tablespoons coffee to each 100 ml (1/2 cup) of water. DOUBLE STRENGTH 4 level tablespoons ground coffee to each 150 ml (3/4 cup) of water. ESPRESSO 2 level tablespoons ground espresso to each 75 ml (1/2 cup minus 2 tablespoons) of water. If you have had your coffee ground, or you have bought it ready ground, it will be in a sealed packet. Remember, once your packet is opened, do not transfer the coffee into another container. Rather close you packet tightly, and place that in an airtight container. These should be refrigerated or put in the freezer, as the grounds do not stick together. Beans can be ground from frozen. Remember, part of the process of achieving the perfect cup, is that coffee must be served hot. This means that every aspect of your coffee making must be heated. The coffee-maker and all its parts, the cups and of course the milk in whatever form it takes. FROTHY HOT MILK is a joy with coffee and there are many appliances and gadgets that will help you achieve a frothy milk and head to your delicious cup of coffee. SOUTH AMERICA is a major producer. Brazil produces the 'Coffea Arabica', at best it could be described as neutral in the cup. The flat bean 'Santos', possibly their best, could be described as smooth with medium to good body and balanced acidity. In addition, Brazil also produces the Robusta variety, which you are most likely to drink when you follow instructions to 'add water and stir'. Colombia is a famous coffee growing area and has held a premier position in the world coffee trade. The beans are picked by hand and are noted for a superb aroma, good body, strong acidity and a rich colour offering a really well balanced brew. Costa Rica is where you will find excellent quality mild coffee of the washed arabica variety, tingling with acidity - a great favourite in Europe. Guatemala, Honduras, Mexico, Nicaragua and many other countries in Central America produce good beans for the flavourful coffee the world loves. The CARIBBEAN produces many coffees, but especially the Jamaica Blue Mountain, which is the most legendary coffee worldwide. Most of this pricey crop is never seen as it is mostly bought by Japan. In AFRICA there are at least 32 African nations where coffee is grown. Kenyan beans are in great demand in Great Britain and the United States, with a delicate smoothness and winey aftertaste. In Tanzania, the best known washed Arabica beans flourish on the slopes of the great Kilimanjaro. South Africa grows excellent Arabica of the Bourbon and Blue Mountain varieties. The coffee is of a commendable mellow quality, smooth and rich.. There are many countries that grow different varieties of coffee - all with intriguing names and provenance. Be adventurous, buy these in small quantities, try them singly or blend with others. Eventually, through experimenting, you will find the style of coffee that suits you and a brew that will become your signature.